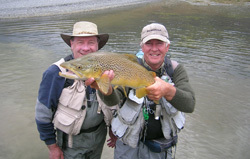 Kia ora (welcome) to my web pages on New Zealand guided flyfishing. 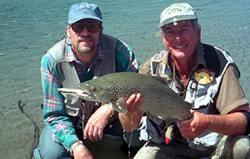 I have been a dedicated fly fisherman for nearly 30 years and full time guide for 18yrs. Apart from the world class fly fishing and spectacular unspoiled alpine scenery, several reasons prompted me to choose fly fishing and guiding in the Mt. Cook/Mackenzie area over other regions. First and foremost, for any visiting overseas angler, this area has one of New Zealand’s most reliable climates throughout the November-April fishing season ... with bright sunny days and low rainfall being the norm and no sandflies. Angling pressure is much lower than in regions such as Rotorua, Taupo and Queenstown. So far, the area has survived much of the ravages of tourism, and visitors are assured of good value accommodation and restaurants as well as the opportunity to meet real New Zealanders ( KIWIS ). I specialise in sight fishing, stalking, and spotting large rainbows and browns... Surely the most challenging and exciting form of fly fishing. All trips are flexible and individually tailored to my clients’ abilities and fitness. I am a member of the New Zealand Professional Fishing Guides Assn and believe strongly in their principles of advocating and protecting the interests of members and clients, and to promote professionalism, sportsmanship and conservation in the interests of angling. My goal - that not only is your New Zealand guided fly fishing trip highly enjoyable and successful, but you leave New Zealand better anglers and with a strong desire to return. My skills as an F.F.F. casting instructor and 18 years guiding will go a long way to ensuring these results. 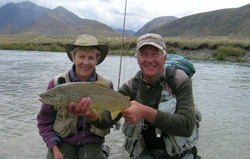 I regard myself as very fortunate in my career choice as a New Zealand fly fishing guide since I find it both stimulating and challenging and brings me in touch with a variety of people from a diverse range of cultures. And, above all, I have the opportunity to share my beautiful country with them. My preference is for river and stream fishing, walking upstream, spotting and stalking rainbows and browns, a unique style of flyfishing and often referred to as "hunting" trout. 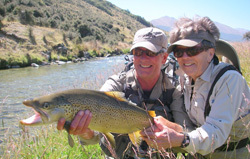 Spotting trout in fast waters or poor light conditions requires many years experience and is a skill top New Zealand fly fishing guides excel at. Whenever possible the dry fly is used, however as 80% of trout feeding is on nymphs near or on the river bed, logically weighted nymphs will have a higher success rate. Often we use a tandem rig comprising a dry on top and weighted nymph suspended underneath. The distance between the two varies depending on water depth. The key to flyfishing success in New Zealand is presentation. Our true wild strain trout generally do not tolerate sloppy casting. Both presentation and drift are essential and it certainly makes for challenging and exciting fishing. Nearly always we cast to visible trout and having guided and fished extensively overseas I can say that there is nothing to compare with this style of New Zealand fly fishing. ''South Island New Zealand where fly fishing dreams are made''.